Living room is the space where your family spends most of their time. That’s where your guests are invited too. One of the most daunting challenges when it comes to home styling is decorating your living room in a kids friendly manner. Those scattered books, toys, shoes and colour pencils make your living room looks like a full time daycare centre ! When designing a home, one of your major priorities will be to decorate your children’s bedroom. But bedroom is not the only place your kids hang out. Living room is where they mostly stomp around. Decorating your living room is thus the biggest challenge. When it comes to kids’ room interior design ideas, you can’t go with the usual home styling patterns. You need to include your kids’ priorities too. Here we come up with 17 easy and creative kid’s room décor tips for your living area. Key factor when it comes to decorating your living room kids’ friendly is to choose the right furniture. Sofa is never an exception! You should give attention to its fabric, colour, design and the space it occupies. Colour: Not all colours go well together. Most people choose dark colour over light colour when it comes to kids’ friendly styling. Although it’s true that it can cover most of the stains, dark colour damages more quickly than lighter colours. Brown is more adaptable than black and goes well with most interiors. Buying a single colour sofa doesn’t mean that you can’t play with colours. Get your hands on some colourful slip-in covers for your sofa and voila! Fabric: Ideal sofa fabric must be durable and resistant to scratches. The most popular choice is leather. Although leather is easy to clean, it is more vulnerable to scratches. Rubbing with toys and claw scratches by your pets can leave deep marks. Genuine leather is not budget friendly too. Another fabric option which is Vinyl, gets cracked with long usage. The ideal choice for kid’s friendly living room is microfiber or synthetic leather, which is tough to differentiate from original leather. Microfiber is budget-friendly, easy to clean and less susceptible to scratches. The only downside being, it is vulnerable to water and stains may get inside easily, although a specialist cleaning can solve this problem. For the out of the box thinkers, you can go for a sofa with denim fabrics, that too with rainbow colours. Your kids will love it too ! Design : You can go for customised sofa designs if you need to accommodate more family members. Design should consider the size of your living room, such that it must not clutter the entire space. 2. Not Just A Cushion! Jumping on sofa is one of the most exciting things for kids to do in the living room. Make sure you invest in such cushions that can be easily flipped and rotated. Feather type cushions are one option which is soft, but of high maintenance and requires daily plumping to keep it in shape. Fibre filling is another choice which is not that soft compared to feather cushions, but of less maintenance. Foam cushions are the best choice for decorating kids’ friendly living rooms, as they are firmer, gives better posture and needs less maintenance. If you are going for dark coloured sofa, you can liven up the whole living room by opting for bright and vibrant sofa cushion covers. It can change the entire story of your design game! The floor is where your kids mess up the most. From toddler to teenager it’s the same old tale. Luckily, you have a good number of kids’ friendly flooring options. Hardwood is one of the most popular choices, as it is easy to clean, durable and sustains most floor mistreats by kids. As it collects lest dirt, animal fur and dust, it is the ideal choice for kids who are allergic. If you are a nature person, you can go for some environment friendly flooring options like bamboo which is durable and sustains floor abuses for years. Choose strand woven bamboo over caramelized bamboo. Laminate flooring is best for those who are on low budget. It is durable, scratch resistant, non-allergic and with very low maintenance. The downside is its slippery nature when it’s wet. If you are non-allergic to rubber, you can go for rubber flooring which can last up to 20 years and is resistant to water, dust, stains etc. Some people may not like the smell of rubber though. And what if your flooring is already done? You can go for kids friendly flooring mats. You can use it to cover your floor temporarily, so that it feels soft under your kids’ toes, meanwhile protecting the flooring below it. Since it is changeable, you can play with different designs and colours. It is also easy to replace with a new mat when it’s stained. Carpet on the floor is ideal when you have a toddler, so that it feels soft underneath the baby’s skin when crawling. It can also change the face of your living room. It is ideal to choose ‘cut and loop pile’ carpets, as it is durable, collects less dust and is soft on the skin. It is an ideal choice for kids who are allergic. Make sure that you choose carpets with low levels of Volatile Organic Compounds (VOC), as it badly affects kids with asthma and other respiratory diseases. Invest in outdoor rugs than indoor rugs which are mostly kids friendly. Colour of the carpet is preferably dark that contrasts your decors, as it can hide most stubborn stains and marks. A cup of coffee in the living room kick starts your day! Coffee table is an absolute essential to any living room. Invest in stylish cushion type round coffee table with less sharp edges to avoid hurting your kids. You can place colourful baskets under this coffee table, which acts as an ideal storage space for your quickies. 6. Walls on the go! All kids are artists. Invest in kids’ friendly washable paints for your walls, so that your little artist has no boundaries. You can also give a try to magnetic wall boards and erasable paints. Converting your living room wall as a small art gallery portraying your kids’ paintings and crafts is another creative on the go. It will motivate your tiny artist to try more creative works. You can also write your favourite quote on the wall in a decorative way. Add some tiny walls lights and hang-up accessories to highlight it. Decorating the walls with shadows of hung up chandeliers can give your living room a vintage theme. When it comes to curtains, go for kids’ friendly fabrics such as cotton which are easy to remove, wash and care for. Make sure it is of ideal length and matches well with your whole living room décor ideas. An empty wall in your living room can be converted to colourful shelves which can elevate its looks, thus acting as a great storage space. You can convert it into a small wall library, in which the lower shelf holds your kid’s books that help them to grab easily. Building separate storage spaces can clutter your living room. Opt for multi-purpose furniture which can provide great inside storage space. Sofas and coffee tables with removable tops can provide ample space to store your kid’s toys, books, game DVD’s and your own essentials. Space around your television is another creative space for storage. Gaming accessories and other electronic things can be stored in TV shelves. You can store things in colourful baskets and place it under your rectangle coffee table. This adds a playful theme for your decors. Built-in cabinets are another viable space for storage that can accentuate your living room if given vibrant colours. 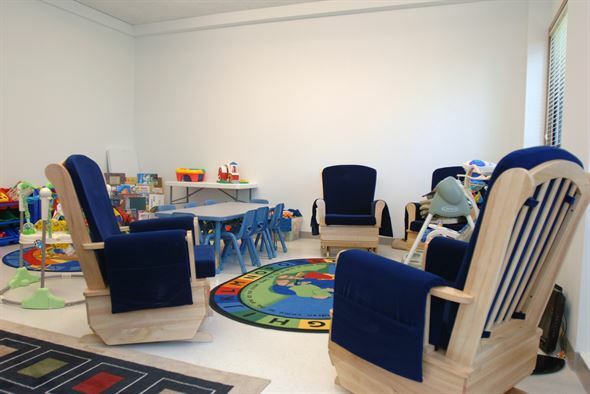 Provide a separate space for kids in the living room, by setting up a separate table and kids’ friendly chairs. It can also be used as a game table for the entire family. Shelves and furniture aren’t the only options for your storage. You can accentuate the looks of your living room, by setting ample storage space by placing colourful baskets hung on the wall. It gives the whole room a vintage effect and gives an illusion of the heightened wall. Use this space to keep sensitive things out of reach from those curious hands! Window seats not just accommodate more people in your living room. Use it to store your valuable goodies out of sight from those tiny investigative minds. Kids love to hang out in open spaces. Never clutter your living room with too much of décor items and furniture, which can accidentally knock down your tiny tots. Go for lighting which can be hung from the ceiling and is out of reach for the kids. Along with safety, it adds stylish appearance to your living room. If you are a vintage lover, invest in colourful chandeliers. Antique lighting pieces are another great option. Make sure it goes well with your theme. Fragile décor items must be kept away from the kids. Kids’ friendly accessories which are not easily breakable such as wood decors can be placed at bottom spaces of your living room. You already spent money on kid’s bedroom ideas and design. Decorating your living room kids’ friendly is another complex task. But it doesn’t mean that you should expend your hard earned money in new decors. Repurposing your old furniture and decors can save you money and can serve your nostalgia for the old goodies. Paint your old furniture with bright colours. Yes, Grandma’s chair can be cushioned with vibrant colours to match your theme. Another DIY for kids room designs, is to use your old serving tray to store your living room quickies like pen, paper, address book etc. Paint it with vintage colours and keep it under your coffee table for that “coffee with colours”. Throw in some colourful personalized cushions with your kid’s name and picture on it. You can also create special wall hangings which embed your kid’s name in unique way. Trust us, it will make them feel super special! Kids’ room decorating ideas are easy and cost effective to follow. While you decide on kids bedroom ideas on budget, it’s equally important to style your living room with kids’ preference too. Involve your kids in decorating your living room. Let them also be a part of deciding which fabric, design and colours to use. Once they feel the ownership of these goodies, it will be difficult for them to handle it carelessly. Kicking with those mudded shoes will no more be an option to them!